TOKYO - Nikon Corporation is pleased to announce the release of its renewed online photo sharing service, "NIKON IMAGE SPACE". This latest version of the service was launched on February 22, 2016. 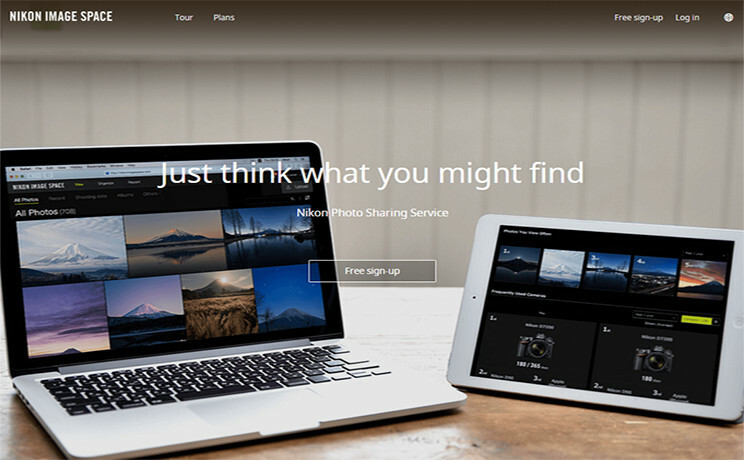 Originally launched in January, 2013, "NIKON IMAGE SPACE", the name of which expresses the fact that it is a space for sharing and appreciating images, is a free online image sharing and storage service open to anyone who enjoys taking photos or recording movies. With this renewal, we have made "NIKON IMAGE SPACE" easier to use and more practical. We have equipped "NIKON IMAGE SPACE" with three new modes that allow users to enjoy photos from a variety of angles. "View" mode supports intuitive browsing of photos, and the new "Report" mode enables analysis of aspects such as photographic tendencies from shooting information for uploaded photos and feedback on shared photos. "Organize" mode (computer version only), also available prior to the renewal, has been improved to enable easier and more natural photo organization with a left-and-right pane layout. Photo sharing functions have also been improved. Users can specify a period of time for which images are shared (share duration), and the service has also been equipped with a function for receiving applause from those with whom images are shared. In addition to the ability to set the share duration, images can also be password protected. What's more, a browsing function that enables automatic display of photos to which the same tags have been attached, much like an album, has been added. We plan to offer collaboration with SnapBridge, our new app announced in January, 2016, that enables constant connection between a Nikon digital camera and a smart device using Bluetooth® low energy. *1 This will enable automatic upload of an unlimited number of 2-MP images to "NIKON IMAGE SPACE" from SnapBridge with a registered Nikon ID*2. *1We will announce the start of collaboration with SnapBridge once the schedule has been determined. *2"Nikon ID" refers to a new individual ID for user registration necessary to enjoy Nikon services. E-mail addresses registered with SnapBridge will serve as Nikon IDs, allowing users to receive services provided by Nikon. Registration is free. Nikon will continue to offer ways of enjoying digital photos and movies with the development of new functions for the "NIKON IMAGE SPACE" service and further improvements to the service. Three new modes are offered as follows. "View" mode, with its simple user interface, enables intuitive viewing of photos, and the new "Report" mode function that can be used to check the number of times an image has been viewed, the number of applauses received for an image, photographic tendencies, and acquired "badges" has been added. Various "badges" can be acquired based on the photographic tendencies of uploaded photos. Checking "badges" can lead to unexpected discoveries, such as users own photographic tendencies of which they were previously unaware. In addition, photo organization is more convenient with drag-and-drop operations in "Organize" mode. Functions related to the sharing of images have been expanded in several ways, including the ability to limit the share duration to 7 or 30 days, to hide shooting data for shared images, and to add credits to shared images. These functions, including that for protecting shared images with passwords also available prior to the renewal, are available for all users, regardless of their membership status. What's more, a function for receiving applause from those with whom images have been shared has also been built into the new "NIKON IMAGE SPACE". In addition to being able to register with, and log-on to, "NIKON IMAGE SPACE" using an SNS (Facebook, Twitter, Google+) account, the service can be used immediately with temporary registration by simply entering an e-mail address and password. Further, photos can be filtered by tags much as they are by shooting date or camera name, so that by simply attaching tags to images, all photos with the same tag can be viewed at once. In addition, tags once entered are displayed as candidates for more efficient tagging.